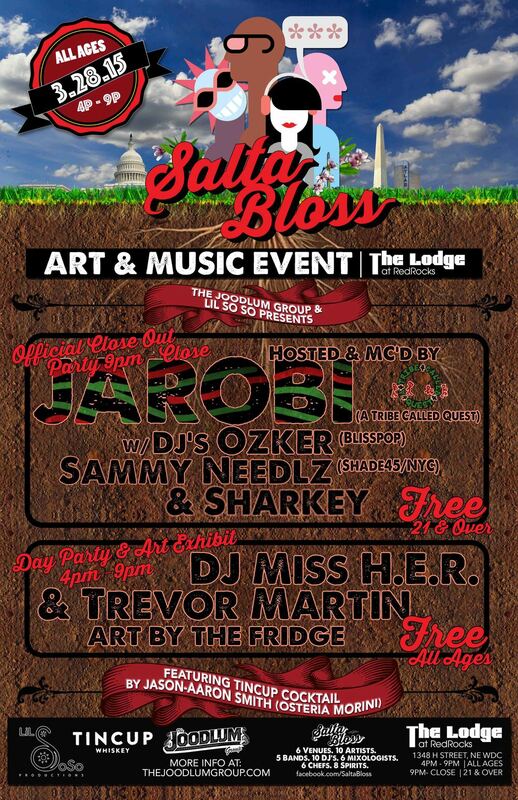 On Saturday March 28, 2015, coinciding with the annual celebration of DC’s Cherry Blossom Festival, the Atlas District will experience its inaugural year of the family-oriented multi-venue celebration and exhibition of the arts entitled, Salta Bloss. Curated by DC’s The Joodlum Group, Salta Bloss will feature hand-picked artists and artist collectives from both DC and NYC to exhibit a combination of visual art, installations and live painting throughout the entire day. Sticky Rice will hold a day party event from 4pm-9pm featuring an Art Exhibition by Rustiko Aregua w/DJ's Cory T & Jax Dux. Special Yagatori Kebabs served by Guest Chef Johnny Bisagni from Slipstream DC. As well as a featured Cuervo Cockatil from Meghan Jackson. The late night evening hours of 10PM - CLOSE will include a dance party w/DJ Recio. Dedicated Sticky Rice event link HERE. Impala will serve an exclusive Proximo branded bar from 4PM-9PM in their outdoor courtyard with featured cocktails from Mick Perrigo (The Passenger / El Camino). Live art will be exhibited and performed by artists Chelove and Mas Paz. While a special Salta Bloss fod item swill be served by Chef Troy Hickman. The 10PM-CLOSE hours will feature a latin and reggae dance party DJ's Leon City Sounds (members of Alumbra). Dedicated Impala event link HERE. Smith Commons will featured Artists Gaia, Brite Idiot, Ariane Gresson & Rey Quinn Starofoam Art for a combination of displayed art, sculpture and live painting. Featured cocktail and special food item on site. More details HERE. Chef Erik Bruner-Yang has a special Salta Bloss food item prepared as well as a featured Kraken cocktail. Stop in to have a taste and see the celebrated venue art done by reknowned street artist Kelly Towles. The Gallery will be showing its EMULSION show presented by Gallery O and East Coty Arys. For more details check the Galley O site HERE.